Hello everybody, and welcome to what is hopefully going to become a series about museums in Japan. I have been to quite a few different museums since I came to Japan, so I thought I would spend some time today to talk about one of my more recent visits, being my trip to the Ukiyo-e Museum in the city of Matsumoto, located in the Nagano Prefecture. If you’d like to read up on my last museum review, you can do so here. Ukiyo-e is a type of woodblock print originally from Japan. It was most prominent between the 17th and the 19th century. The term 浮世 [Ukiyo] means floating world, and 絵 [e] is the Japanese character [漢字, kanji] for painting. Ukiyo was the word for a leisurely lifestyle during the Edo Period in Japan, which was from 1600 to 1867. Arguably the most famous piece of art from Japan is The Great Wave off Kanagawa, also just known as The Wave, is Ukiyo-e, made by the artist Hokusai, who has his own museum, which I will talk about soon. So, know that you have a basic idea about what Ukiyo-e is, let me talk about the museum is. Note; None of the paintings shown above are actually displayed at the Ukiyo-e museum, or maybe I just missed them. The first is part of a private collection, the second is at the Metropolitan Museum, the third is at the Cincinnati Art Museum in the United States, and the final one is at the Indianapolis Museum of Art. Before I start talking about the exhibitions inside of the museum, some quick background information. The museum was established in 1982, and displays works owned in the museums private collection, belonging to the Sakai family, who still own and run the museum. The building itself was designed by architect Shinohara Kazuo. 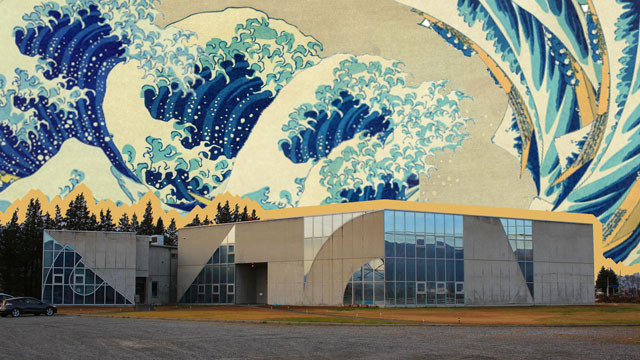 The building is made to resemble The Great Wave by Hokusai, which you can see in the image above. It is located on the outskirts of Matsumoto, therefore it is not the most easily accessible. You need to get a cab from the Matsumoto trainstation, or, alternatively, walk for quite a while. It is not very far if you are traveling by car though it is not hard to get to. The Museum has a huge parking lot, which you can see in the image above. Now, on to the actual museum itself. When I arrived at the museum, I was rather surprised by how it is a lot smaller than it looks. The entire second floor is used for storage and workshops, and cannot be entered. That leaves just the first floor. Everything on the left of the door is used for the gift shop [which is very impressive, you’ll spend a lot of time in there] and staff offices, leaving just the first floor on the right side. There is always one special exhibition on display, and a very small permanent exhibition, which, along with original pieces of works, features recreations of famous works such as The Great Wave by Katsushika Hokusai, shown in the image above. These recreations are not photo-copies, but are woodblock prints made by other artisans that feature famous works by other artists. The current temporary exhibition is titled 美人競 びじんくらべ -やまとなでしこからモダンガールへ | Comparing Beauty – From the Traditional Ideal Japanes Woman. It has been on display from October 1st, and can be viewed until December 25th. Along with traditional Japanese artists, the exhibition shows many works by artists born abroad, such as works by Fritz Capelari, who was born in Austria. Part of the permanent exhibition is a set of display cases that show the materials and tools that go into making Ukiyo-e. The museum does a very good job of displaying all of the information in both Japanese and English, making it very accessible to foreigners. Something that really bugs me though is how little care has seemingly gone into the display of the works, the signs often being crooked and so oversized that it makes the entire museum feel a bit cheap. This is really unfortunate as they otherwise put a lot of effort and care into preserving the woodblock prints, only displaying the works for 3 months at a time and keeping the lights dim to make sure that the works are not damaged. One of the best parts of the museum is the video that shows the process of making Ukiyo-e. It is available in both Japanese and English, and is roughly 25 minutes long. As the museum is very under-visited, they start the screening on demand, and so enable you to choose the language. Upon arriving, we were the only people in the museum. The video covers everything from where the aper, wood and paint comes from, to how to properly print. It also shows how the printers make all of their equipment themselves, i.e. the brushes and pads. I think it is time to talk about the gift shop now. The gift shop is almost as large as the exhibition space [almost, not quite.]. In it you can buy tons of postcards [as I have], along with other Ukiyo-e branded items such as t-shirts, mugs, magnets. The usual. In a separate room one can purchase both Ukiyo-e photo-copies and recreations. These can vary from 2.000¥ [roughly 17€/18$ at the time of writing], too over 20.000¥ [roughly 167€/177$]. They are very beautiful.